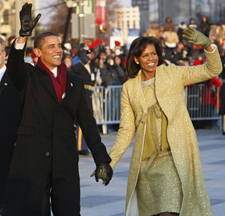 President Barack Obama’s second inauguration is shaping up as a high-energy celebration smaller than his first milestone swearing-in, yet still designed to mark his unprecedented role in American history with plenty of eye-catching glamour. A long list of celebrity performers will give the once-every-four years right of democratic passage the air of a star-studded concert, from the bunting-draped Capitol’s west front of the Capitol, where Obama takes the oath Jan. 21, to the Washington Convention Center, which is expected to be packed with 40,000 ball-goers that evening. The first family will lead a parade of clanging bands, elaborate floats and marchers, including costumed dancers, prancing horses and military units, down Pennsylvania Avenue. The president will dance with the first lady, whose dress seems destined to be most anticipated fashion statement of the second Obama administration. A new element of the inaugural events will be announced next week, with the appointment of around half a dozen “citizen co-chairs,” community leaders from across the country chosen because they represent the president’s accomplishments and commitments. They will take part in inaugural events throughout the weekend. 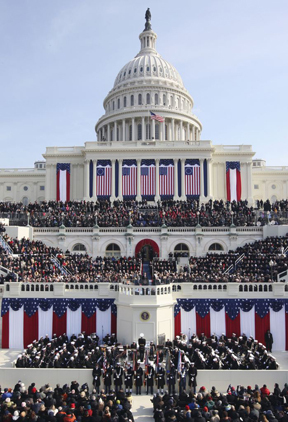 Estimates of turnout are 600,000 to 800,000, compared with the 1.8 million in the record crowd on the National Mall four years ago to see the first swearing in of a black president. The mood of this 57th inauguration will be tempered by the weak economy, high unemployment, the aftermath of the Connecticut elementary school shooting and the long war in Afghanistan that’s expected to require U.S. combat forces through the end of next year. Yet developments in the last week have shown that inaugural enthusiasm is high. A limited offering of $60 inaugural ball tickets for the general public sold out quickly, and inauguration planners have tried to crack down on a scalping business that’s sprung up online. There’s an impressive list of celebrities, including Beyoncé, Katy Perry and Usher, who have signed on to perform. While organizers said Obama was cutting back the number of balls from 10 last time to just two this year, The Associated Press has learned that they are expecting more than 35,000 to attend the larger of the two and 4,000 to attend a ball in honor of U.S. troops — double the size of four years ago. Another factor that could increase turnout is the unseasonably warm weather in Washington. Early forecasts indicate that Obama will be taking the oath of office while the temperature is in the 40s, with hardly any chance of precipitation. Steve Kerrigan, president and CEO of the Presidential Inaugural Committee, said that just because the festivities are going to be smaller doesn’t mean they are going to be any less significant. Obama’s speech gives him a moment to command the world's attention on a level that’s rare even for a president. If history is any guide, Obama will try to put behind the divisive election. He has the State of the Union three weeks later to make his points on taxes, guns, immigration and other issues. It’s a good bet this day will be a patriotic love letter to America. 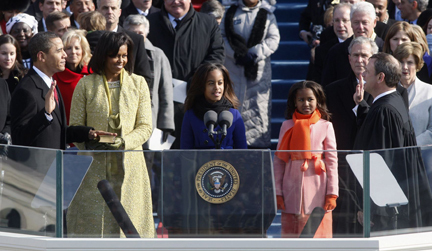 The 2009 inauguration will be remembered as a milestone for a nation built on slavery and blood-stained by the civil rights movement. But Obama clearly has that historical context in mind for his second go-round, as evidenced by the Bibles he chose to place his left hand on while taking the oath of office — one owned by Abraham Lincoln and one by Martin Luther King Jr.
Their selection is especially symbolic because Obama’s second inauguration comes on the federal holiday marking King’s birthday and in a milestone anniversary year involving both men. It was 150 years ago when Lincoln signed the Emancipation Proclamation to end slavery, and 50 years ago when King delivered his “I Had a Dream” speech from the steps of the Lincoln Memorial — a monument that will be straight ahead in Obama’s sight as he speaks to his country. The inauguration will transform Washington, where most federal offices would be closed for the King holiday, by shutting down streets downtown and bringing regular daily life in the city to a halt. Viewing stands are set up along Pennsylvania Avenue for the parade from the Capitol to the White House. Street lamps will be removed, then replaced at the day’s end.